We’ve covered the Spleen meridian on the last post which was our Yin meridian and continue to the pairing Yang meridian, the stomach. Along with the spleen, the stomach plays one major role in our bodies, which is to break down and digest food, in order to extract the necessary nutrients and vitamins from food we consume. 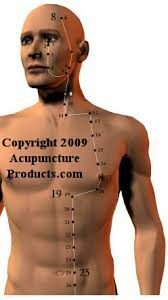 The Stomach meridian begins from the end of the Large Intestine meridian just under the eyes. It goes around the nose and down around the mouth and up each face cheek looping up to the forehead. The meridian then drops down from the lower jaw through the neck, across the shoulder then to the sternum. It then branches into two parts, one that follows down the ribs, stomach, groin and ends all of the way down to the tip of the second toe. The second branch follows a similar path but ending in the big toe to connect with the Spleen meridian. The stomach meridian, along with the spleen, is associated with your muscles. Any imbalance in this meridian is associated with stomach, muscles, nose and digestive problems. As well you may feel high intensity of anxiety, worrying, skepticism, low self-esteem, and feelings of mistrust. Besides the poses below, adding a bit of sugar to your diet may help balance this meridian, although always watch your intake. The stomach meridian is associated with the Earth element. When balanced, people will know about fairness, stability and being properly anchored. Also, keep in mind that yellow is the color associated with this meridian and avoiding any spicy food may help balance it as well. Add the following poses to you practice to balance the stomach meridian. Start in Downward Facing dog, lift up the right leg into Three legged dog then move the right foot all of the way forward between the hands. Follow by dropping the left knee, then bend it driving your foot towards the front. Place the left hand on the floor, then grab with your right hand your left foot. Hold this pose for 2 to 3 minutes then go back to Downward facing dog and try it with the left foot now. This is an intense pose so take your time to get into it. 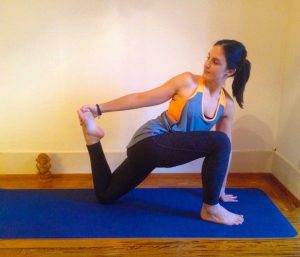 If you feel pain or discomfort on your knee, do not try this pose. After you’ve done both legs, go into Child’s pose. Start on your knees, make sure your tights are hip width apart then inwardly rotate your thighs. Place your hands in front of your bones of the pelvis, and drive your hips forward as you send your back backwards just a bit. Then as you start to send your hips more forward, drive your shoulders and elbows back, placing both along the back of the hips and send your head back. If you feel any discomfort in your spine or back, come out of the pose immediately, do not try it further or try to hold it there until you’re ready to go further into the pose. If you want to go into the full pose, drop your hands until your palms touch the heals of the foot and hold for 1 minute. To safely come out of it, place the hands in the back of your hips, then slowly come back up. Go into Child’s pose and let the energy settle into your body. These stomach meridian poses are also great for working the back, inner thighs and hips. (be advised if you have any specific physical conditions or discomfort, do not practice these poses).